Frank’s a great puzzling character. He always had a surprise up his sleeve. Iconic and as tall (short man I know) as the 20th century, bags of curiosity and a habit of sidestepping the caricature when the need would arise. And so it happened in 1969; it was thought that Frank’s sales were slouching and he needed to take a fresh look at his work. It’s possible he absolutely did look around at the world of 1968/69 and think that the finger snapping post-Brat Pack Frank was out of step, or he might have stumbled over an amazing record written and produced by Bob Gaudio for his group, The Four Seasons. It was called ‘The Genuine Imitation Life Gazette’, and it was a record that told a story. Whatever he thought about his career, he wanted to follow this example and hired Bob and lyricist Jack Holmes to write a record which told a story, a concept record. The story is that of chap who loses his marriage, his wife, for the city, leaving her husband and 2 sons.Watertown is small town America, commuter land and it’s good enough for the narrator but there is not enough there to hold his disillusioned wife. She may have had an affair, we’re not sure until later. But the narrator’s disbelief that this breakdown could happen and his attempt to come to terms with it, is the constant theme throughout. The format is a clever device, as most of the conversations and developments happen in letter writing. This is heart rending, maybe not the most groundbreaking, but serves the mini epic so well. However, what is so significant is the idea that New York’s galavanting hero, Sinatra, would make a record about small town America. It just was not done back then. Now it’s everywhere. Small town America in 2016 must not be ignored, another cliche. Back then it had critics scratching their heads. 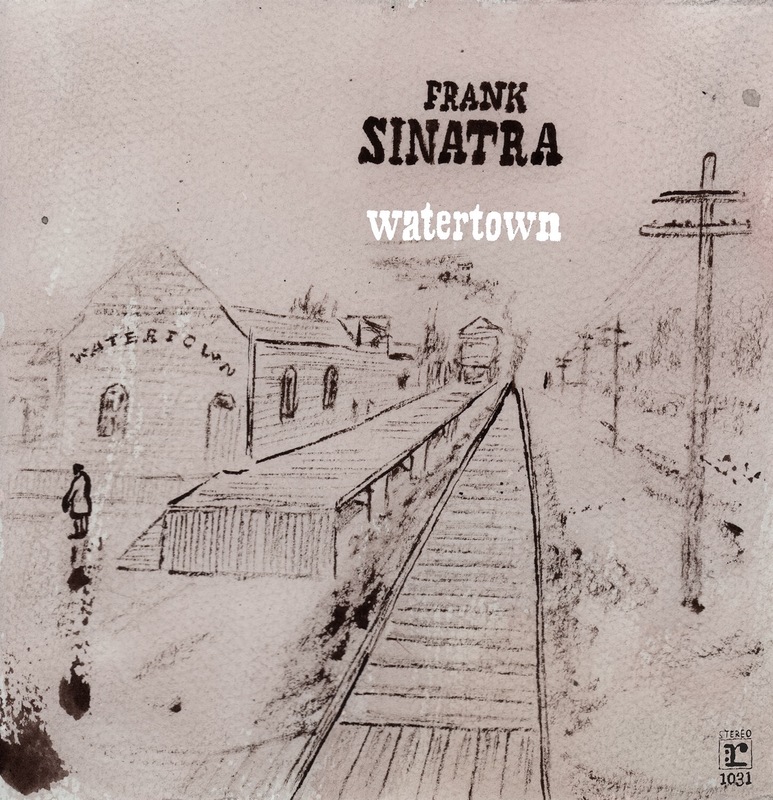 Watertown was dismissed as Sinatra’s least selling record, his failure (??) Get back to it Frank!!! So, the marriage break up happens over breakfast in an undramatic fashion. Everything happens slowly in Watertown. It rains, the dogs move slowly, the locals shuffle down town, and the healing happens slowly. That overriding weight of inertia is the overriding theme. And so to the music. The most interesting part for me. This is a Bob Gaudio record for Frank. Frank gave a great performance because he knew that the project was right and groundbreaking. The critics did not know this. Even the idea of a concept record succeeds here where others fail, because the writing is so so strong. The arrangements shine, and the writing is sublime, Jimmy Webb moments, Nelson Riddle moments, sweeping and unexpected tunes but tunes, tunes, tunes. For me its ‘Michael & Peter’ that illustrates this so well. This is American music at its best, the key changes keep coming, the strings climb, the vibes vibe in just at the right time, and the coda is so wonderful, it rolls and rolls and never resolves. It fades into a yearning desire for more, the lyric over and over ”You’ll never believe how much they ‘re growing’‘. This is all said in a letter between the separated couple. There is still love there and the children are still their children. But there is a slight reference to an affair: “least thats all the news I can say, I’ll find the words some day.” Small talk set to music as big as Bernstein or Sondheim. The intro to ‘For A While’ is amazing – it could be the modern romanticism that the European composers brought to Hollywood in the 1930s. The song then falls into a lovely stroll. Our narrator is just getting on with things, but he’s not over her. As the record moves on the hope the narrator expresses is lamentable. He just does not get the fact that its over. He cannot move on. ‘Whats Now Is Now’ is pure Jimmy Webb. It moves along on an insistent bass, harps and flutes ever present, the harmonica sneaks in. The narrator begs that she should have spoken about the affair. ‘‘We could have got over it” he begs, ”let’s go back to what we had, I can forget”. The sadness is laid in beauty. ‘She Says’ is stark and voiced on a classical guitar. She indicates that she will return… but she does not, as ‘The Train’ leaves us in a quandary. ‘Lady Day’ is a reissue addition. Recorded for original release it was cut, but Frank revisited the song. Rewinding to the top, the opener ‘Watertown’ kicks off with a slightly menacing bass but quickly opens into gleaming shuffle which is a bit of a Bob Gaudio signature on the record. It’s a classy sounding record so it is surprising to learn that the orchestral backing tracks were recorded in a matter of days in August 1969. Frank added vocals in October later that year. The idea of achieving arranged perfection in such short a time is quite something. Frank Sinatra reminds me of Miles Davis in so far as we know these artists as icons in their respective genres , but both risked their critical sanctity by reaching out to contemporary forces in pop in the hope of refreshing their art. After Watertown Frank made ‘Sinatra & Company’ with Jobim, who at the time would have been another odd choice of collaborator. Sinatra was a music fan, but those around him who even then were more interested in his iconic status and legacy than his ambitions, petitioned for him to either retire a King, or snap back to the Sinatra that the public wanted. A recent BBC TV special on Sinatra dismissed Watertown as his great failure, the rock bottom that, now reached, could only mean a return to better days. It’s a stunning record which is at last being attributed the credit it always deserved, but it’s a slow mend, just like the record, just like the story, just like Watertown. Jake Holmes was Guido’s co conspirator on Watertown. Guido had approached Holmes to work with The Four Seasons on Genuine Imitation Life Gazette after hearing Holmes debut solo album The Above Ground Sound Of Jake Holmes which featured the original Dazed & Confused (as made famous by Led Zep…and Holmes was for a LONG time uncredited) Sinatra was apparently taken with Saturdays Father from Genuine Imitation Life Gazette when he approached the pair to collaborate. Curiously track 2 of Genuine Imitation Life Gazette ; Mrs Stately’s Garden, presents a scene of small town gossips talking of a girl who went away to Watertown! If it hasn’t already been included TNPC should find a home for the Genuine Imitation Life Gazette too. Thanks for the brilliant insights into the recording Ray. A beautiful heartbreaking record. I must confess to being oblivious to GILG, but will endeavour to explore following yours and Sean’s recommendations. I have listened to Watertown a thousand times, and each listen brings new revelations. Sinatra is brilliant and raw with emotion and passion. It is virtually the only Sinatra album that was not recorded live with the orchestra. When I first heard it in 1970, it made me the ultra Sinatra for life because I loved the fact the the greatest singer of all time was taking a chance on redefining his art. Thanks for recognizing this wonderfully touching, sadly misunderstood, gem. I gave this to my Mom for Xmas in its year of release. It was already to be found in the “cut out” bins. The gorgeous embossed interior of the fold open album cover (designed by Don Snyder) depicts the varied mementos of a family scrapbook in progress and is a compelling reason to seek out the original vinyl. the worst selling of his career. It sold only 15,000 at the time its’ release. trailblazing. Who could blame him ? Thanks Rob. I do like In The Wee Small Hours, Sings Only For The Lonely etc, but to me they always sounded too polished, whereas Watertown sounds fragile, heartfelt. If Sean hadn’t written so well about it, one of us would have… Thanks again for the positive feedback.